I don’t blog as often as I once did, mostly because I’m so busy at work. (Also, having two kids now doesn’t give me lots of extra free time.) Sometimes I get asked about what AllSet Learning is doing. I’ve even been criticized for not writing about it enough here! Q: Is AllSet Learning still providing 1-on-1 Chinese lessons in Shanghai? Q: But you’re also doing other things? Yes, working day in and day out with individual learners helps me stay in touch with learners’ needs and keeps me sensitive to where the gaps still are. Then we release products to fill those gaps when we have time to develop them. So we’ve got the Chinese Grammar Wiki, Chinese Pronunciation Wiki, iOS Pinyin chart and Picture Book Reader, and Pronunciation Packs, plus the books we developed for Mandarin Companion. Q: And you still have time for new clients? Yes, in fact, we’re currently gearing up to start new clients post-summer, so if you’ve been deliberating, now is a good time, while there’s still room. Summer is typically our low season, so we spend more time on product development, then get busier again with client duties in the fall. Q: So were you developing anything new this summer? Q: Aren’t you also involved in the Outlier Chinese Dictionary workbook? Yes indeed! I’ve already started meeting and discussing with Ash, and that project will start soon as well. I’m very excited about this, because it’s something I’ve sensed a need for among my clients. Unlike some language issues, characters are not something I want to tackle on my own, so it’s very satisfying to be part of a larger effort at helping making characters more accessible to learners. That’s about it for now! 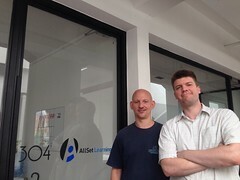 If you’re curious about anything AllSet Learning is doing, please get in touch.